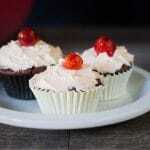 Super easy chocolate and cherry vegan cupcakes. Combine the cake mix and the seltzer. Spoon the mixture into a lined cupcake pan. Place a pie cherry on top of each cupcake. Follow the baking direction on the cake mix. Allow to cool before frosting. For frosting: beat the vegan butter, powdered sugar, vanilla, and pie cherry liquid together until well combined, about 3 mins.